Sapping Attention: How Bad is Internet Archive OCR? We all know that the OCR on our digital resources is pretty bad. I've often wondered if part of the reason Google doesn't share its OCR is simply it would show so much ugliness. (A common misreading, 'tlie' for 'the', gets about 4.6m results in Google books). So how bad is the the internet archive OCR, which I'm using? I've started rebuilding my database, and I put in a few checks to get a better idea. Allen already asked some questions in the comments about this, so I thought I'd dump it on to the internet, since there doesn't seem to be that much out there. First: here's a chart of the percentage of "words" that lie outside my list of the top 200,000 or so words. (See an earlier post for the method). The recognized words hover at about 91-93 percent for the period. (That it's lowest in the middle is pretty good evidence the gap isn't a product of words entering or leaving the language). Some books may be in entirely or partly foreign languages, and thus full of non-words. A lot of the error words may be fragments where a word was split up into two chunks, but only one word was missed. My Perl preprocessing script could be making punctuation related mistakes that create false words that aren't OCR's fault. (For instance, I run together hyphenated words). The second is the big one there, I think. Some of the error words may be concatenations of two words. (This isn't as likely, I don't think, as the reverse). Misreadings might confuse two real words--'them' for 'then', for example. I'm already counting a lot of typos as words in my top 200,000. Just eyeballing some randomly selected lists, I'd guess as many as half of my 'words' are actually typos. I'm sure there are others in both directions. Some of those are foreign words, but a lot are obviously typos. It would be _great_ for my database if I could just drop out all the typos, so I'd love advice on how to do that--I've thought about just running some clustering routines on frequent typos to see what words appear disproportionately often in books with bad OCR, but that might be risky. So what percentage of words are typos? That's really hard to say, but let me give some examples. Perl regexes inside R let us look for some of the common misreadings I've noticed: we can look for every word that has some characters characters commonly misread as each part of 'the'; 'f' for 't', 'li' for 'h', and so forth. Putting every word that looks like "the" together, I get about 2.2 million words. Not all of those as actually misreadings of 'the' (some are probably weird words, some are misreadings of "this", "line", or whatever), but that's probably a good ballpark guess. There are about 196 million occurrences of "the" in the flesh in the database. So that's an error rate of about 1% on the (somewhat) obvious misreadings of a short word. I think 'h' is one of the harder characters to read, based on the errors I've looked at, so that would imply IA OCR is well above 99% accurate on a character basis. (One study on the IA site found 99.6-99.9% accuracy on more modern texts, so that doesn't seem unreasonable for the whole corpus). Another way we might find errors is by looking for lone letters. "A" and "I" excepted, these make up about 1% of the words in my sample; two letters words less common than 'ye', which seems to be about the cutoff between real words and errors, make up about 0.8%. (And both those counts include a number of legitimate initials, roman numerals, etc.) Since each individual detached letter or two letter chunk probably indicates only a fraction of a missed word, this isn't terrible. So what's the conclusion? I suspect that over 85% of words overall are correct in the IA scans, and possibly as much as 90%. The error rates are high enough, though, that using this for sentence processing is problematic--word counts should work all right, though we should be aware that the incidence of longer words is probably slightly underrepresented. Still, I don't see much that indicates using words is going to be dramatically flawed except in a few cases we should watch out for, such as when a word might be a misreading for one a hundred times more common. "i tve flyron a lciimifiil dagger mounted with coldwbicu lifui bccn ttic ptopirty of ifie rcdouhtix klfi ucy lbt i wiie to play tlic part if dionied in the jliajj cur byron sent mt so mi"
The median percentage of words in my sample is 94.2%, which is a little higher than the mean of 93.1% see at the top. The best book is 98.2% accurate. agreed with Anthony (above), it's good to see you working out these problems. again, though, i think you're too centered on *your* database and monkeying around with it - this is good information to have for those of us also interested in building a database, but these methodological points seem to be the focus, whereas one could imagine some of your blog content moving over into actual sustained attention to a single historical problem/issue. you can do it! i think now's the time, and these methodological posts can run right alongside that sort of work. what do you have in mind? Great work Ben. To be clear, I think there's an issue with some of the IA's OCRing of Google books. It's not a general comment about IA's OCR. The issue I'm really thinking about is what might happen if you were working with a small(er) sample (say, 100-1000 books) and you mixed texts with significantly different OCR quality. I can imagine some sort of difference in vocabulary being an artifact of OCR. And the effect would be magnified if one was doing principle component analysis. In other words, let's say you were interested in the frequency of the word "universal" and a certain group of texts, having poor OCR, had one in every 20 words misspelled. Another thought: what if spelling errors are more likely to crop up in longer words? What if the error rate was 20% for words longer than 8 characters. I feel like these issues are important to address if work in text analysis in the "digital humanities" wants to be taken seriously by folks in other disciplines. Is this being overly cautious? I now remember how/why I got concerned about this. 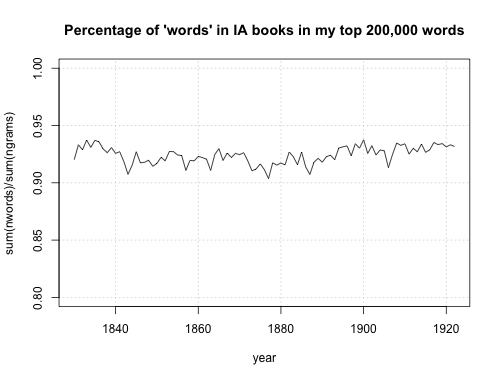 I was working with a smaller dataset (100 19th century novels) and I decided to use a *very* rough metric of OCR quality: percentage of words misspelled (by a modern word spell checker, aspell). I found that the difference was considerable. It's important to note that Google epubs are end-of-line dehyphenated so I'm sure that helps the metric.